What exactly is The Blackstar Chronicles? Blackstar is a futuristic massively-multiplayer game that features both ground -based character combat as well as space-based ship combat on a massive scale. The developers at Spacetime Studios say it's based on the single-player traditions of "Wing Commander" and the multiplayer feel of "Descent." Lofty goals, but when your team is packed with Wing Commander and Privateer veterans you've got a good shot at getting it right. The IP fell into a bit of trouble after a 2006 publishing agreement with NCsoft fell through earlier this year, but the team at Spacetime has just announced that they've acquired the rights from NCsoft to soldier on, and that's a damn good thing. I would have hated to discover that the amazing character designs seen above and at their official website were never going to come to fruition. This is exactly the type of game I've been craving since the disappointment that was EA's Earth and Beyond. 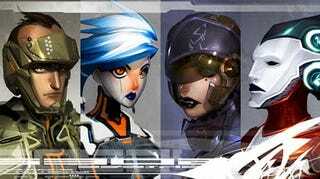 AUSTIN, Texas - May 8, 2008 - Spacetime Studios, LLC announced today it has acquired the rights to the Blackstar IP from its previous publisher NCsoft. Spacetime Studios, an independent game development studio made up of industry veterans, now fully owns all the tools, technology and intellectual property from their previous publishing deal. Set in the far future, Blackstar is a fresh universe full of wildly original space fighters, horrifying demonic enemies and epic drama. "The IP lends itself to almost any kind of gameplay that one could ask for, and was specifically designed to be a long-term franchise," said Cinco Barnes, creative director and co-founder of Spacetime Studios. "It's a nice sweet spot when you own all the puzzle pieces and we now have extraordinary flexibility in where to take the game universe next." "After two years of development, the Blackstar universe is quite near and dear to our hearts" said Gary Gattis, executive producer and co-founder of Spacetime Studios. "Owning the IP as well as the engine and tool set puts a tremendous amount of potential in our hands. With all the developed components under the Spacetime team's control, the options for the IP are diversified." The new "Blackstar Chronicles" development underway is a space fantasy combat game based on the single-player traditions of "Wing Commander" and the multiplayer feel of "Descent." "The Blackstar Chronicles is a very powerful product," said Jake Rodgers, art director and co-founder of Spacetime Studios. "The Blackstar universe has the potential to be something special and it's great that we are able to bring the IP to fruition." More information about the studio can be found at http://www.spacetimestudios.com.